by John A. Duncan of Sketraw, KCN, FSA Scot. Tartan has without doubt become one of the most important symbols of Scotland and Scottish Heritage. With Scottish national identity arguably greater than at any time in recent centuries, the potency of Tartan as a symbol cannot be understated. However, it has also created a great deal of romantic fabrication, controversy and speculation into its origins, name, history and usage as a Clan or Family form of identification. Tartan is a woven material, generally of wool, having stripes of different colours and varying in breadth. The arrangement of colours is alike in warp and weft – that is, in length and width – and when woven, has the appearance of being a number of squares intersected by stripes which cross each other; this is called a ‘sett’. By changing the colours; varying the width; depth; number of stripes, differencing is evolved, and a length of tartan is made by repeating the pattern or sett over and over again. Although there are instances of Tartan as far back as the 5th century BC, it is likely those examples were the product of whatever was available for weaving and probably changed from year to year. One of the first recorded mentions of Tartan was in 1538 when King James V purchased “three ells of Heland Tartans” for his wife to wear. 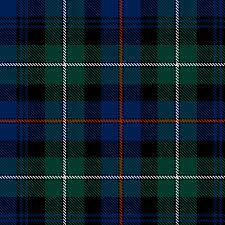 And in 1587, Hector Maclean (heir of Duart) paid “feu duty with sixty ells of cloth, white, black and green“- the traditional colours of the Maclean hunting tartan. An eyewitness account of the Battle of Killecrankie in 1689 describes “McDonells men in their triple stripe” but the first positive proof of the existence of what we now call ‘Tartan’, was in a German woodcut of about 1631 which is thought to show Highland soldiers – no doubt mercenaries – in the army of Gustavus Adolphus and wearing a clearly identified tartan philamhor – the great kilt. The next important milestone in the history of tartan was the 1745 rebellion ending with the Battle of Culloden in 1746 and the following genocide in the highlands. The romantic Young Pretender, Charles Edward Stuart – Bonnie Prince Charlie – ranged his inferior Jacobite forces of Highlanders against the Duke of Cumberland’s Government forces. The Jacobite army was organised into Clan regiments and as historian Jamie Scarlett explains “here we have the first hint of the use of tartan as a clan uniform.” To understand how this battle proved to be the catalyst for the great Clan Tartan myth, we have to look at the lifestyle and the terrain in which many of Scotland’s major families or clans lived at that time. Each area or community grouping would doubtless have, as one of its artisans, a weaver. He – they were invariably men – would no doubt produce the same tartan for those around him and that tartan would initially become what we now call a District Tartan – one worn by individuals living in close geographical proximity such as glen or strath. By its very nature, that community would be one huge extended family that soon became identified by its tartan which it wore, not to differentiate it from its neighbours in the next glen – but because that is what its community weaver produced! It was one short step from there to connect that tartan to the name of the wearers. All weavers depended very much on local plants for their dyes so the locality of the weaver might well have some bearing on the colours of the tartan that he produced. If he lived on the west coast of Scotland, Gipsywort would give him lettuce green, seaweeds would give him flesh colour and seashore whelks might provide purple. If he lived inland, then he would undoubtedly look to the moors for his colours: heather treated in different ways would give him yellow, deep green and brownish orange; blaeberries (the favourite food of the grouse) would provide purples, browns and blues; over 20 different lichens would give him a wide range of subtle shades. If he was affluent or dyeing and weaving for a customer of some substance, then he would seek more exotic imported colours of madder, cochineal, woad and indigo. If the concept of clan tartans was born at Culloden it wasn’t universally known – in that battle there was frequently no way of differentiating friend from foe only by the tartan he wore. The only reliable method was to see with what colour sprig – a bit of plant – each combatant had adorned his bonnet, which would differ to show the affiliation to one’s Clan. This is represented in Scottish heraldry today as a ‘Plant Badge’ that would be worn by a follower to show loyalty to one’s Chief. After Culloden and the following genocide that occurred throughout the Highlands, the Government was determined to destroy the Clan System and raised an Act of Parliament known as the “The Disarming Act,” one of the laws being to make the wearing of tartan a penal offence for the next 36 years until 1782. This proscription however applied only to common Highland men – not the upper echelons of Highland society, not to Lowland Scots and not to women. But most importantly, it did not apply to the Highland regiments that were being formed in the Government army. William Wilson and Sons est. 1760 of Bannockburn, near Stirling was relatively unaffected by the ban on tartan and continued to mass produce Setts of tartan for the Military and the Upper classes. The Wilson’s “Key Pattern Book” of 1819 documents weaving instructions for more than 200 Tartans – many of them tentatively named – produced at their Bannockburn dye works and weaving sheds. There is no evidence that Wilson’s Tartans had anything whatsoever to do with any ancient regional or pre-1746 patterns. The Tartans worn at the Battles of Sheriffmuir or Culloden have almost all been lost forever. 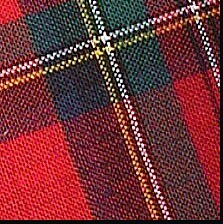 In 1816 an attempt was made to match Clan to ‘true’ Tartan. Tartans were gathered but these had more to do with regimental uniforms and Wilson’s successful marketing than any older patterns. But the idea that Tartan and Clan paired had become firmly established. When the laws were repealed in 1782 there was a resurgence of Scottish nationalism and efforts to restore the spirit and culture of the Highland after this lengthy period of repression were encouraged by the newly formed Highland Societies in London (1778) and Edinburgh (1780). Thanks to the personal planning of Sir Water Scott, the 1822 visit of King George IV to Edinburgh was to see Highland Chiefs being persuaded to attend the levee and other functions, all attired in their Clan tartans (some did not go). Almost overnight tartan became popular and families, who probably had never before worn tartan, (and hated the Highlanders) became the proud possessors of family Tartans. This, along with Sir Walter’s romanticism of Tartan in his novels, was to aid the Clan and the tartan to become synonymous. Another great boost to tartan came from Queen Victoria and her Consort, Prince Albert. They fell in love with Balmoral – the Royal residence on Deeside in Scotland – and with tartan and all things Highland. Prince Albert designed the now world famous Balmoral tartan, and they bedecked room after room with it, further consolidating the Victorians’ romanticised view of the ‘noble’ Highlander. Over the last fifty years or so tartan has developed into a multi-million pound industry dominated by a few large mills. More than family ties, Tartan is now associated with regions, companies, and any manner of organization. Today tartan holds a unique place in the annuals of textile history and has come to symbolise, along with the kilt and bagpipes, the cultural identity of the whole Scottish nation.